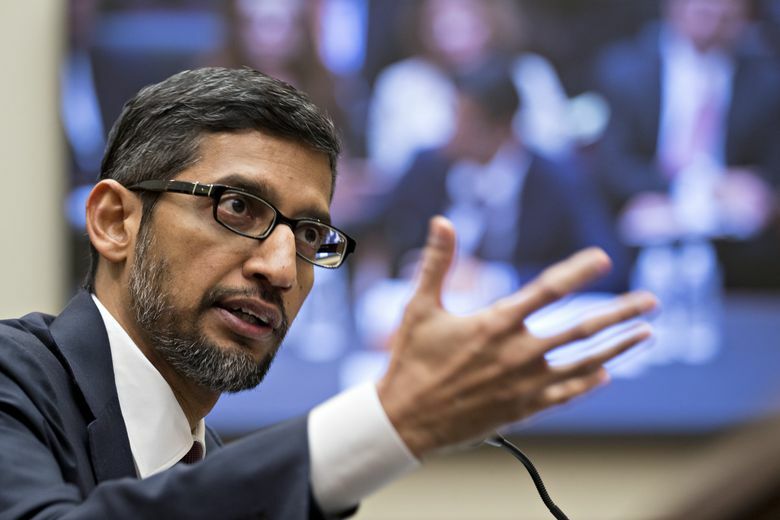 Google CEO Sundar Pichai speaks during a House Judiciary Committee hearing in Washington, D.C., on Dec. 11. (Bloomberg photo by Andrew Harrer). Five of the largest U.S. tech companies spent 10 percent more on their federal lobbying efforts last year than in the record-setting 2017. This drastic increase could prove a hurdle to advocates and privacy hawks in Congress trying to pass a tough federal privacy bill. Five of the largest U.S. tech companies poured a combined $64.2 million into federal lobbying efforts last year, according to new ethics reports. That’s a more than 10 percent increase over their record-setting 2017 spending. Google alone made up about one-third of that total, spending more than $21.2 million in 2018. That’s up almost 17 percent from the previous year, when it spent more on federal lobbying than any other company. Amazon spent $14.2 million, Facebook spent $12.6 million, Microsoft $9.5 million and Apple $6.6 million. Their disclosures, released ahead of a midnight deadline, showed the Big Five invested to sway the debate in Washington, D.C., on a wide range of policy issues, ranging from privacy to election security to antitrust. This drastic increase in lobbying cash could prove a formidable hurdle to advocates and privacy hawks in Congress trying to pass a tough federal privacy bill. Lawmakers are insisting that 2019 will be the year they finally pass a national framework — and privacy advocates are increasingly concerned that tech companies’ well-funded lobbying machine could outweigh consumers’ voices on Capitol Hill. The eye-popping sum comes as tech companies find themselves clashing with D.C. more than ever. Lawmakers and regulators have been sounding the alarm about companies’ lax data practices and the misuse of consumer information by third parties since the public learned of Facebook’s Cambridge Analytica scandal, in which a political consulting firm that did work for the Trump campaign used people’s data without proper permission. They’re also scrutinizing whether the companies have done enough to crack down on disinformation campaigns after Russia used social-media platforms to spread fake news and information during the 2016 campaign. Technology companies are now coming to the table for the first time to create federal privacy legislation to head off a stringent new state law in California, which has been signed by the governor and will take effect in 2020. The law will give consumers the right to know what information companies collect about them, what they’re doing with it and whom they share it with. The law could pose a serious challenge to many of the companies’ data-collection practices and create serious impediments for businesses that rely on targeted advertising. And several other states are looking to considering their own actions on privacy this year. A federal privacy law that pre-empts state level legislation would be “a bad deal” for consumers, said Singh Guliani. “We need baseline standards, but states need to have the flexibility to respond to new privacy threats,” she said. In addition to lobbying, privacy advocates are already on alert for signs that the technology industry is dominating the debate. In the fall, the Senate Committee on Commerce, Science and Transportation held a major privacy hearing, intended to kick off discussion about privacy at the national level in the wake of California passing its own privacy law. The hearing featured executives from several major tech companies, but it did not include consumer-privacy advocates. The move sparked criticism, and the committee later held a hearing that featured such advocates. “We wouldn’t want that perspective to dominate the debate,” Singh Guliani said. The increased oversight of the industry is not likely to go away in 2019. “When you come of age as an industry, as we have, and you make so many things possible, you’re also going to be under scrutiny for all of the consequences of that, too,” said Linda Moore, president of the trade group TechNet. It’s not just the companies’ spending on lobbying that could sway the privacy debate in Washington, D.C. Their increased influence is also a reflection of the former high-profile policymakers and regulators who many tech companies have hired in recent years. Jeff Chester, the executive director for Center for Digital Democracy, said there’s been a “revolving door” between both Republican and Democratic administrations and the tech-industry lobby. “There is ultimately a huge conflict of interest,” he said, as Congress seeks to pass privacy legislation. He’s not optimistic that Congress will be able pass legislation with serious teeth, and he’s instead focused his efforts on grass-roots privacy campaigns. “It’s very likely the federal bill is going to be a weak one and not really do anything,” he said. Though the privacy debate has heated up in D.C. since California passed its law, it’s still early innings, said Michelle Richardson, director of the Data Privacy Project at the Center for Democracy in Technology. Senate Democrats have floated some national privacy legislation, and Sen. Marco Rubio, R-Fla., introduced a privacy bill last year. But she’s expecting bipartisan privacy bills to be introduced in the spring.